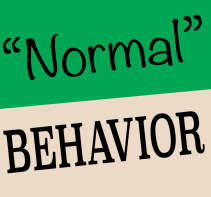 This concept of normalcy is based on developed schemas within our minds and personality that formulate presuppositions of how people are expected to behave in any given situation. These schemas are automatically created as a result of being raised in our society, that is, they are the culmination of a completion of childhood development. For example, we have a schema for how a person should behave when standing in line, eating at a restaraunt, sitting in a class room, or walking in public. Behavior that deviates from a schema a little bit is overlooked and easily shrugged off. But if someone behaves in a manner that far outside our schema for what is “normal”, this is when prejudice and stigma begin to take hold. Let’s illustrate this concept with a brief example. Example: Consider a man who uses his fingers occasionally to pick up pieces of his salad at a nice restaurant. Now, perhaps this would be extremely distasteful to some and utterly inappropriate. But for many it may seem a bit odd, but nothing too extreme. But now imagine he uses his hands and fingers to eat his steak. He just picks it up and eats it. He isn’t making noise, he isn’t disturbing anyone, and certainly no one has to watch him. But think of all the instantaneous judgments that might be happening. This kind of behavior is not merely outside of our schema for what is “normal”, it is severely outside of it. For many people, it is entirely abnormal. This is an example of how stigma is formed. We see a behavior or see a person that deviates a long way from our idea of normal, and instead of trying to understand, we make personal judgments, or worse, have strong negative emotional reactions (.e. “I’m offended and disgusted!”) to things that might not even be actually hurting or negatively affecting us.